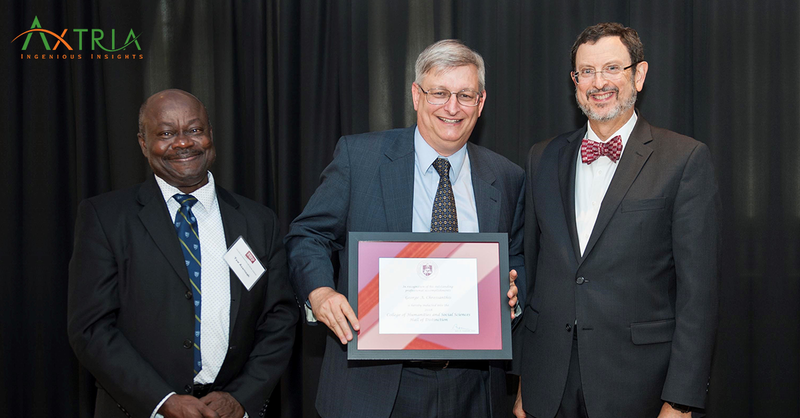 Axtria is proud to recognize that our Principal Scientist, Dr. George A. Chressanthis, has been inducted into the Indiana University of Pennsylvania (IUP) College of Humanities and Social Sciences (CHSS) Hall of Distinction. On September 28, 2018, Dr. Chressanthis and other alumni from across the CHSS were inaugural initiates in the CHSS Hall of Distinction, an honor bestowed on less than 0.1% of CHSS graduates. Dr. Chressanthis is a 1977 graduate of IUP (B.A., Economics). Over the years, he has continued to serve and support IUP in a variety of ways. Currently, he serves on the CHSS Dean’s Advancement Council (council bio). He also holds the university’s highest honor as an IUP Distinguished Alumni Award (2005) recipient. Furthermore, he has been a large benefactor to IUP, supporting scholarships for students in economics and piano performance, as well as serving on the Foundation for IUP Board of Directors. Dr. Chressanthis is currently a Principal Scientist at Axtria, a newly-defined position held since his arrival in July 2016. He brings a unique combination of professional experiences into the analysis of strategic and operational issues affecting the biopharmaceutical industry. He is a former executive in the pharmaceutical industry with achievements in academia, holding senior professorships in healthcare management, marketing, economics, clinical sciences, and political science. His research focuses on pharmaceutical commercial issues and their intersection to drug industry business, public policy, clinical treatment decisions, patient outcomes, and cost of care. He spent 14.5 years from 1995-2009 working in the pharmaceutical industry, with the majority of his time at AstraZeneca Pharmaceuticals LP US headquarters leading teams in support of sales force strategy, sales operations, sales analytics, and other commercial analytical functions as well as leading numerous special projects for senior leadership. Other industry experiences include positions at Wyeth-Ayerst Laboratories, IMS Health, and ZS Associates. He held full-time professorships in Healthcare Management and Marketing in the Fox School of Business and a secondary professor appointment in Clinical Sciences in the School of Medicine at Temple University prior to joining Axtria from 2010-2016. He also held other academic positions from 1982-1995, culminating with being awarded Professor of Economics (with tenure) and Associate Professor of Political Science with research graduate faculty status at Mississippi State University. He received his Ph.D. in Economics from Purdue University. Congratulations to Dr. Chressanthis on this very special honor. Axtria is proud of your many accomplishments and your positive impact on so many, from the IUP community to Axtria. Dr. George A Chressanthis receiving IUP CHSS Hall of Distinction recognition. Left to right: Dr. Yaw Asamoah, Dean of CHSS, Dr. George A. Chressanthis, and Dr. Michael Driscoll, current President of IUP.